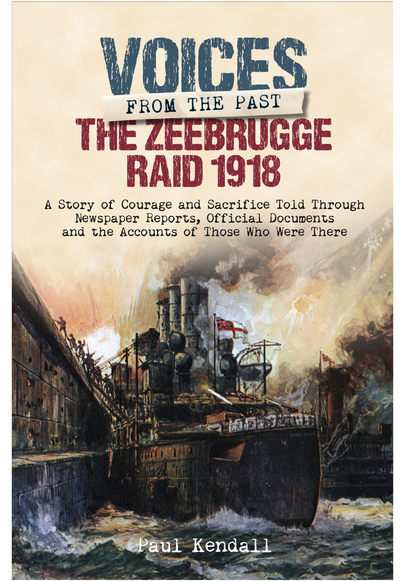 You'll be £25.00 closer to your next £10.00 credit when you purchase Voices From the Past: The Zeebrugge Raid 1918. What's this? Approximately a third of all Allied merchant vessels sunk during the First World War were by German boats and submarines based at Bruge-Zeebrugge on the coast of Belgium. By 1918 it was feared that Britain would be starved into surrender unless the enemy raiders could be stopped. A daring plan was therefore devised to sail directly into the heavily defended port of Zeebrugge and then to sink three obsolete cruisers in the harbour in the hope they would block German vessels from reaching the English Channel. The cruisers were also to be accompanied by two old submarines, which were filled with explosives to blow up the viaduct connecting the mole to the shore, whilst 200 Marines were to be landed to destroy German gun positions at the entrance to the Bruges Canal. On 23 April the most ambitious amphibious raid of the First World War was carried out, told here through a huge collection of personal accounts and official reports on the bitter fighting which saw more than 500 British casualties from the 1,700 men who took part, and saw the awarding of eight Victoria Crosses. “Zeebrugge Raid 1918” is a fistful. Printed in Pen & Sword's familiar 9 ½ x 6 ½ inch format, it is easily carried in a briefcase or backpack. The font is relatively small but that is necessary to keep the physical product at 314 pages and prevent it from becoming too thick for convenient handling. The eight-page photo section is somewhat brief but still contributes greatly to the overall product. It includes a pair of remarkable photos taken immediately following the battle as well as a series of German photos showing the scuttled vessels late in the war. From the British perspective, this certainly qualifies as one of the finest accounts available on the Zeebrugge Raid. It is highly readable, well organized and makes for a worthy addition to Pen & Sword's “Voices from the Past” series. If you want the exact course of this dramatic operation, with lots of pictures, then I can certainly recommend you this study. You're really in the midst of the battle! The nature of the material used in this interesting book results in a certain amount of repetition but the author succeeds in linking all the elements of this complex operation in an interesting and exciting way. The book, which contains only one map, would have benefitted from several more to aid greater understanding of the operation, is well-researched and has an extensive bibliography. Although not a definitive history of the raid, is a good and interesting read. Recommended. Along with the excellent ‘Images of War’ series, ‘Voices From The Past’ is another very good idea from Pen & Sword. For those that haven’t read a book in this series before; these books tell a particular story through a combination of first-hand accounts, official documents and newspaper reports. A great success story for the German in the Great War were its U-boats, which sank a staggering third of all the Allied merchant vessels lost in the Great War. Pressure was mounting on the Royal Navy to do something about this. So, on the 23rd of April 1918, St. George’s Day, the Royal Navy began an operation to scuttle three obsolete cruisers to the Bruges Canal at Zeebrugge in an attempt to prevent U-boats accessing their base. The three ships were accompanied by two submarines, filled with explosives to blow up a mole, and 200 royal Marines were to be embarked to try and destroy the German gun positions at the mouth of the Bruges Canal. Easily the most daring amphibious raid of World War One, the British took 500 casualties out of the 1,700 men who took part (eight Victoria Crosses were awarded). The mole was destroyed by blowing up a submarine and the three blockships were scuttled. The survivors managed to escape back across the English Channel. This ia very effective way of telling the story, using the actual words of the men who were there to bring it to life. Pen and Sword have done a fine job with the photographs in this book. This is a fine achievement on the part of Paul Kendall and is highly recommended. A story of courage and sacrifice told through official documents, newspaper reports and the first-hand accounts of those who were there. On 23rd April 1918, the Royal Navy embarked on a daring operation to scuttle three old cruisers in the entrance to the Bruges Canal at Zeebrugge in an attempt to prevent the U-Boats which has wrought havoc in the waters around the UK during the war from using their base. Two submarines packed with explosives were also going to be used to blow up a viaduct connecting the Mole to the shore, while 200 Marines were to destroy the Germans' gun positions at the entrance to the canal. This then is the account, often told in first-hand eyewitness form, of one of the most ambitious raids of the Great War. The fighting at Zeebrugge resulted in over 500 British casualties, out of a total strength of 1,700. The raid resulted in the awarding of eight Victoria Crosses. The author skilfully weaves the personal accounts into his informative, detailed and well written narrative and thus it makes for riveting reading as we follow the events and people involved as they unfold. I had no trouble at all in selecting this as the Editor's Choice this month, standing, as it does head and shoulders above everything else, and I highly recommend it. Nearly a decade ago, Paul Kendall compiled what was - and probably remains - the definitive account of the world's first commando raid, Zeebrugge. With a further elaborate sub-heading 'A Story of Courage and Sacrifice Told Through Newspaper Reports, Official Documents and the Accounts of Those Who Were There' just about sums the book up in one sentence. Broken down into 28 bite-size chapters, The Zeebrugge Raid is a 'blow-by-blow' account of the action through the eyes of those who were actually there rather than from a historian's viewpoint. Eight pages of black and white photographs, a single plan and a comprehension section on Notes and Reference all combine to make this one of the most comprehensive and detailed accounts of this famous raid to date.